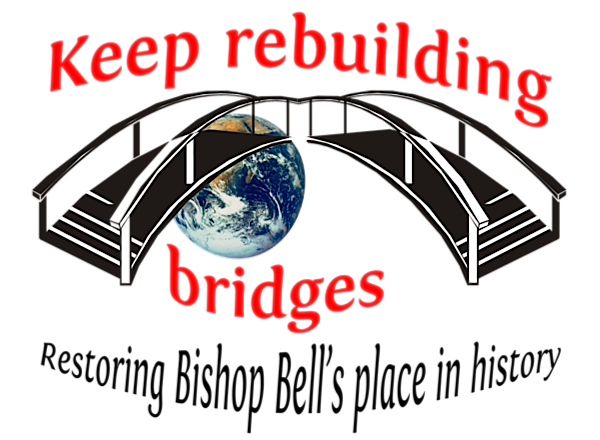 The following words were addressed to the Keep Rebuilding Bridges conference on October 5. The transcript is reproduced with permission from https://ashenden.org/2018/10/05/justice-for-bishop-george-bell/ which should be referred to if any of the web links malfunction. I am going to suggest to you that not only has the Church of England been partisan, prejudiced and incompetent, but it has sacrificed George Bell on the altar of its capitulation to a growing totalitarian zeitgeist. It is changing the meaning of language, our hierarchy of ethics and threatening our freedom of speech, and especially our freedom to criticise it. Many of you will immediately sense the resonances and echoes of Germany in the 1930’ amongst other associations. 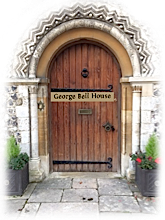 I will try to persuade you that the rehabilitation of George Bell matters not only as a matter of natural justice, but also because his life, values and witness act as a wake up call to an English Church that has started to capitulate to another wave of political totalitarianism, just as the German Church did in the 1930’s. To use a dramatic metaphor, George Bell and his close collaborator Dietrich Bonhoeffer acted as a fire alarm, warning that both Church and state and Christian values were in danger of being burnt to the ground by an intolerant aggressive new secularism. Othello is a masterclass in manipulation. It is an exercise reshaping the images of who people are practicing deceptive distortions of the truth; after which the characters of the play, failing to see each other as they truly are, set about one another in a catastrophe of destruction. Moral. If you don’t tell the truth about people, chaos will ensue. ‘The Lord,[d] the God of your fathers—the God of Abraham, the God of Isaac and the God of Jacob—has sent me to you.’ (Exodus 3). But accusation has a spiritual and theological dynamics too. “And I heard a loud voice in heaven, saying, “Now the salvation and the power and the kingdom of our God and the authority of his Christ have come, for the accuser of our brothers has been thrown down, who accuses them day and night before our God. Rev 12. False accusation and the assault on reputation private or public is a symptom of our struggle with evil. The panoply of contemporary Human Rights. v. In effect, the Church reversed the burden of proof without taking real steps for the case for Bishop Bell to be developed and investigated. In the reaction to the knowledge that the Palace at Chichester was inhabited by kindertransport children over the years. The core group chose to assume that this meant that Bishop Bell had interest to and access to children which he might have misused. Lord Carlisle points out that the proper inference is that since paedophiles are invariably repeat offenders, the lack of any kind of corroborative claim counts powerfully in Bell’s favour. They chose to ignore the evidence Canon Adrian Carey, his chaplain who worked for Bell, and had th closest opportunity for scrutiny. But what if this was not just incompetence, but the early waves of incoming tide of progressive repression- a new cultural authoritarianism? For some years many of us have put down the continues assault on Christian culture to a creeping secularism. And there is no doubt that is accurate. But what we are facing is not simple secularism. It has morphed into something more antagonistic and more organised. It has fed of the twin factors of the increasing sexualisation of our culture and a movement which is driven by a fixation with equality. It seems best described as Marxism 2.0 – or new Marxism, some call it cultural Marxism. Marxism has always been dedicated too the enforced totalitarian utopianism of so called ‘equality’. It sought to achieve it through a revolt of the proletariat and the Marxist Leninist economics, but failed. The economic theory proved inadequate to support the ideological edifice of utopian egalitarianism that was built on top. The Frankfurt school gave to thought to a Marxism 2.0 which would seek the same ends, but by a different route. Not a revolution in the proletariat, but a revolution of cultural values. What this movement has done is jettison any sense of the presumption of innocence because in its lexicon, there are certain people who are existentially, politically and morally guilty just by their identity. So in particular, men, white people, older people, Christian people, are guilty already. It is this background ration of politically correct identity politics that the Church of England has chosen to absorb and adopt in its refusal from Arhcbishop Welby, and Bishop Martin Warner down to the core group, to presume the guilt of George Bell, who must and should be presumed innocent. Perverse political tolerance means the celebration and promotion of an ethics of rebellion against God, particularly in the area of sexual unholiness and perversity and the exclusion of Christian values. INCLUSION for Christians is the ambition that there are no places where the mercy of God will not stretch inviting people to turn and be held by the Good Shepherd who will carry them home. Perverse political inclusion is the overturning of Christ’s teaching by celebrating what he warned us to avoid and detest, in particular the perversions that pour out of the corrupt human heart that defile the soul. And the exclusion of Christian values. George Bell was not a saint. There is no movement to canonise him. Such mechanisms don’t exist in the Church of England, but there is plenty of evidence that Bell himself was a Christian whose whole life was orientated to the practice of self restraint, self-giving, self sacrifice. Andrew Chandler, the latest biographer of Bell, opens his book with his delight at having found in Bell’s papers a day-book journal in which Bell wrote his daily prayers and quotes and gathered material. There Bell copied down Gerald Manley Hopkins aphorism on ‘chastity of mind there’. There we find his own preoccupations for his own ethical integrity. Pauline, the witness Lord Carlisle found who lived in the Palace at Chichester while Bell was there talked about his integrity and the moral calibre. Adrian Carey, his chaplain described t the end of his life how Bell’s goodness and affection were strangely apparent” (p.198) Carey was struck by the consistency of his integrity and observed that during all his years in the Bishop’s Palace, he observed not as single lapse. If George Bell were really guilty of sexually interfering with a young girl behind the scenes in the Palace age Chichester it would require him to have a split in his personality that would verge on the schizophrenic. But in the absence of any evidence of his guilt, one of the most important features of the George Bell defamation process has been the way in which the Church of England has jettisoned the traditional Christian celebration of virtue and sanctity and replaced it with the politically correct preoccupation of identity politics, the celebration and sanctification of victimhood. Christian ethics gives way to no other value system in its care and prioritising of the vulnerable and the abused. Christ himself is the ultimate sacrificial victim. Of course it does. But not at the expense of refusing to test truth claims. Nor at the expense of violating the ancient principle of holding innocent until proved guilty; nor at the expense of natural justice. But as we know, the Church of England investigation into George Bell, inept, myopic and apparently prejudiced as it was, preferences uncorroborated and untestable allegations over the whole range or usual ethical, professional and cultural values Bell exemplified. At one level it causes deep concern and responses ranging from great distress to outrage that the dead can be so defamed without any restrain or recourse to justice. Many commentators on this new movement see it as a new fascism. The overlap between Nazism, as National Socialism and totalitarian Marxism has long been caught our attention. Both seek to impose a totalitarian state on alternative value systems, democratic or otherwise; one used the values of race, the other of class. This most recent one uses identity and hierarchies of power. And he has posthumously fallen victim to a growing movement of totalitarian ambition that is abusing Church and Society. George Bell is often praised for his ecumencial generosity and his work with refugees. His humanitarianism in the face of the evils of warfare is praiseworthy and wholly commendable. But equally important was his voice that warned of the dangers of Nazism and his support for Dietrich Bonhoeffer active resistance. Bell points us to Bonhoeffer, and I want to suggest that his rehabilitation today is all the more pressing as we find ourselves needing an English Bonhoeffer as we face this assault on Christian values and witness, and assault on the authority and integrity of the Bible and a closing down of free speech at the hands of this increasingly aggressive Progressive assault. And the Church seems to have let go of its willingness to act as a prophetic voice in its relation to the state, and develop a role or a persona that is more akin to a benign psychotherapist. It seems to care only to affirm people, and dare not challenge them. But look at some of the other symptoms of totalitarianism in the 1930s and see if there are any parallels today. Where are the voices of the bishops of the Church of England holding the Labour Party to account for this dreadful repetition of a hateful creed that the experience of the holocaust should have made impossible in a civilised society? The signs of the the diminution of freedom of speech stretch from Christian street evangelists begin arrested by the police for hate crimes, and then being either found innocent or released after being held for 24 hours without charge. Teachers have been sacked for holding bible studies in the schools they taught in in their free time in lunch breaks. Nurses have been sacked for offering prayers as part of the humanitarian support. The Christian Legal Centre is being overwhelmed with case after case if Christians being discriminated against at work and silenced in the public forum. But one of Bell’s most formidable contributions to to his area came in an article he wrote in the Fortnightly review in 1939. His main purpose was to hold the State accountable to Christian values and ethics. “The Church is not the State’s spiritual auxiliary with exactly the same ends as the State.” His main concern was with the bombing of civilian populations, and rightly so. But we can look to him as offering us too a prophetic voice that challenges the easy assumptions, particularly found amongst the Church of England’s hierarchy, that the values of the state, political and ethical are or ought to be validated by the Church. Currently the state we live in is making significant and to many of us serious moves away from Christianity. For many of us the death of 7 million aborted children is a scar on our conscience that unlike biological scars, causes a searing pain, and takes place despite the law on abortion being breached instead of observed. The Church of England has adopted the secular narrative of inclusion over biblical and universally observed ethics of sexual expression. In a context where the Church has yet again put collaboration before its own integrity Bishop Bell stands as a beacon of prophetic integrity when the need to speak to the State at the point where it determines to adopt ethics that are likely to bring upon it civic and democratic diminution, and even perhaps, divine judgement. The price of this kind of disastrous conflict, which is not so much about the sexual experiences of two teenagers, but Moore about a clash of cultures, is that few people will feel that it is safe to stand for public office in case some real or fictitious misdemeanour from 30 years before will be alleged, without any mechanism for distinguishing between character assassination and genuine criminal behaviour. Allowing George Bells’ reputation to remain under what Justin Welby so infelicitously called ‘a cloud’ undermines what the Church and the faith stand for at so many levels and in such serious ways. George Bell has always represented integrity, duty, compassion, the prophetic voice of the Church raised against injustice and evil. He is an ikon of resistance to the destruction of freedom and faith. If he is allowed to be sacrificed to pad out the shaky credibility of incompetent archbishops and bishops and a colluding and increasingly corrupted Church, the integrity of faith and those who remain faithful to Christian witness will be tragically and disastrously impaired, and our capacity to contribute to the virtues of democracy and Christian values in the body politic tragically restricted.